The first scholarship fund designated to benefit Lower School students was established this spring to honor longtime Lower School administrative assistant Beth Crawford. Beth passed away in February after a courageous nine-month battle with cancer. She joined the Durham Academy community in the 1980s as a parent to Andy Crawford ’97 and Matt Crawford ’99, and then in 1996 became the Lower School’s first administrative assistant. Beth served in that role for 20 years, up until her diagnosis last summer. Beth worked tirelessly behind the scenes to provide support and organization for faculty, students and parents, and she was a beloved member of the Lower School family. As a parent, she was a huge supporter of the school and instilled a strong sense of loyalty and community in her sons. 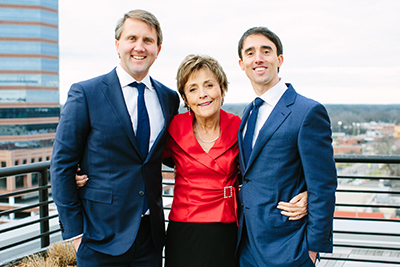 Andy Crawford and Matt Crawford chose to create this fund in her memory to honor their mother’s commitment to the Lower School and to demonstrate how much Durham Academy meant to Beth and to them. The Beth Crawford Lower School Scholarship Fund is perpetual and will provide aid each year to a deserving Lower School student, beginning this fall. If interested in contributing to the fund, visit the online giving page.